Triphala is a traditional Ayurvedic formula rejuvenation formula that promotes deep cleansing of the gastrointestinal tract and supports the proper functions of the digestive, circulatory, respiratory, and genitourinary systems. 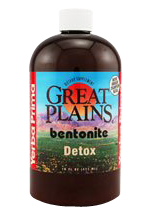 Contains: Great Plains Bentonite has maximum purity. There are many different grades of bentonite, primarily designed for industrial uses. Yerba Prima uses only USP/NF pharmaceutical grade bentonite that has been through a natural four-step purification process. This not only ensures that the bentonite is ultra-pure, but also contributes to the light color and strong activity of Great Plains Bentonite.